#10YearChallenge is the latest trend on the Social Media. From Celebs to Common Man, Postings have been done drawing comparisons with the pictures shot 10 Years Ago & At The Present Time. 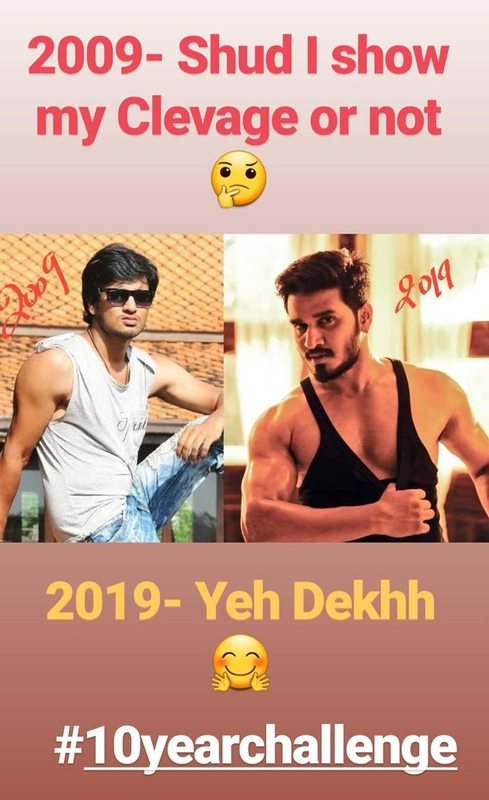 Hero Nikhil Siddhartha accepted the #10YearsChallenge. He shared photographs of himself in two different times zones with the captions '2009 - Should I Show My Cleavage Or Not' and '2019 - Yeh Dekhh #10YearChallenge'. Nikhil asking whether he should show his cleavage raised many eye-brows. He should have done it normally but tried something different and offered scope for controversy. It's more like inviting criticism from the feminists! Nikhil needn't have to do so such things at least when his upcoming flick 'Mudra' is gearing up for release. Hence, Raising the suspicion whether if it's intentionally done to draw the attention. Who Knows?